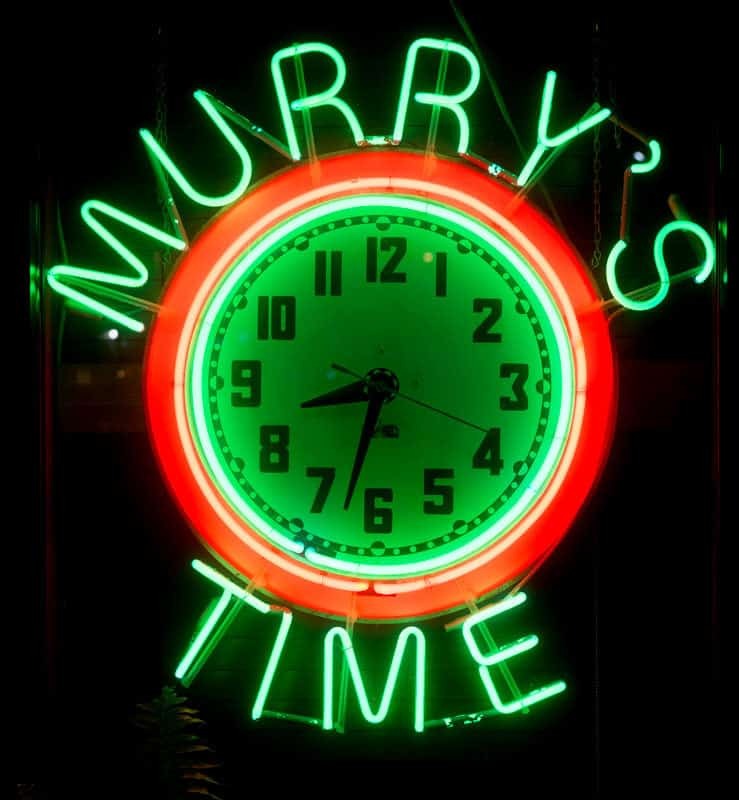 Murry’s marks 32 years of good food and cool jazz. Ask three locals where you can find battered and fried green peppers served up hot with a generous sprinkle of powdered sugar, and odds are at least two of them will know exactly where to send you. The same goes for Bob’s Bobs and Blue Chips Cheese Bread. These dishes may surprise the uninitiated, but will lure them back to Murry’s again and again. The menu at Murry’s notably is free of cumbersome descriptions, and many Columbians know it by heart. After all, they’ve been ordering from that menu for more than 30 years, and it remains largely unchanged. The Murry’s faithful keep coming back, out of the bright sun and into the dimly lit place with the marble tabletops and Miles Davis recordings reminding them that they need more jazz in their lives. They leave their troubles with the stone gargoyle at the entrance and check out the desserts on the board before picking up a menu they don’t really need. There’s a certain trust on the part of Murry’s regulars that whatever comes out of Bill and Gary’s kitchen is going to be good. Bill Sheals and Gary Moore are friends and business partners who don’t take life or work too seriously. Their restaurant, after all, is named after a plant from Booches Billiard Hall, if that tells you anything. Conflicting reports say the original Murry was actually a patron, but Bill swears it was a plant. It’s possible the gargoyle knows the whole truth, but he isn’t telling. That’s another point of contention. Bill says it’s not a gargoyle, but whatever it is, it has been greeting patrons at the door wearing a fashionable hat for 32 years. There must be a colossal hat rack somewhere in the back because regulars claim they’ve never seen the same hat twice. Bill is still sad about the (not) gargoyle’s high school marching band shako that went missing a few years back; he really liked that one. Pilfered hats aside, there is still much to be happy about in this, their 32nd year of “good food and good jazz,” as the motto says. And such is the pace of the place. The restaurant has taken on the spirit of its owners — laid back and full of good cheer, as long as the jazz is humming in the background. “Good food is easy. There are no recipes,” Bill says. Start with good ingredients and try not to screw it up. It seems they’ve extrapolated this approach to life itself, with their little chunk of a strip mall off Green Meadows Road. In 1985, the guys set out to create a place where you could go get a great meal in shorts and a T-shirt. They envisioned a casual place for any occasion or no occasion at all, where you can spend 20 or 120 bucks if you are so inspired. While everything on the menu is a la carte, there are prices that an underpaid jazz musician can afford, while a record label executive would be hard pressed to find a better filet or shot of whiskey on that side of town. 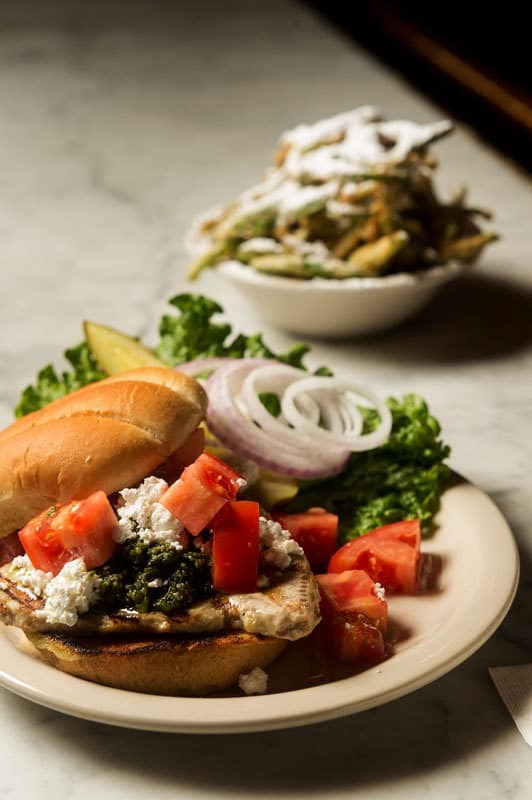 Take the tuna, pesto and feta sandwich. Bill points out that a similar sandwich can be found in a fair number of places. This pesto, though, arguably is the best around, as is the tuna itself. Bill knows that; he’s just being polite. His crew in the back makes the pesto daily. This rare tuna steak is dressed to the nines, and you won’t find a tastier sandwich for less than $7 anywhere. Add a side of fries or onion rings (both are big enough to share) and a glass of rosé for the perfect lunch. Should you bring the kids? You can, of course, but the ambiance may be lost on them. Murry’s wants to be a place for grown ups. If the kids can listen to Coltrane’s “A Love Supreme” all the way through, then they’ve earned a seat at the table; otherwise, this is a perfect place for date night, a business lunch or ladies’ night out. And if you’re going solo, you will feel right home at a table or the bar by yourself. The important thing is that you go if you have not been and if you just haven’t made it over there in a while, let this be a reminder that your green peppers with powdered sugar are waiting for you.